With a busy semester ahead, I have decided that it would be helpful to make meals in advance and freeze them. At least one day a week I will have to eat lunch and supper at school, and it is way cheaper to bring my own food than buy it from the expensive cafeteria. If I can just grab something from the freezer the night before to thaw in the fridge, it will save me time and energy during the busy weeks. Yesterday I made Kris Carr’s split pea soup recipe ,this time adding the kale and dulse seaweed. I also made a spicy chickpea recipe that I plan on posting later. The soup was split (haha) into small tupperware containers, and I sliced pieces of bread and froze them in individual ziplock bags to have with the soup. To make room in the freezer I had to finish off a bag of frozen mangos. So, I decided to make muffins with it. Here is the recipe that I discovered from holycowvegan.net. I used a different oil, halved the sugar, and doubled it because that’s how much mango I had. I’m thinking that you could replace the mango with any frozen fruit. Here’s the recipe for 12 muffins. To make the mango purée, I took all the mangos I had (probably about 5 cups. I doubled the recipe) and simmered them in a pot until it resembled a chunky sauce. I had to add a bit of water at first to avoid burning. I did not add any sugar, as I figured the mango had enough sugar in it already. I then pureed the mangos with a hand blender until it was smooth, but with a few chunks. Next I mixed all the dry ingredients in a large bowl (flour, baking powder, baking soda, and nutmeg), and all the wet ingredients in another bowl sugar, coconut oil, flax meal mixture, and vanilla). The puree was added to the wet ingredients. Next, I incorporated the wet ingredients into the dry ingredients by folding them together with a spatula. It’s important not to over-mix. I greased some muffin tins and used an ice cream scoop to divide the batter equally. I baked the muffins at 375*F for about 20 minutes. What I did is set the timer for 17 minutes and then checked the muffins with a toothpick until it came out clean. I judged by the look of the muffins that they were still too wet. So, they probably baked for about 22 minutes. This may be due to the fact that I doubled the recipe and had 24 muffins in there at once. The nutmeg in the muffin is a delicious addition, and the mango makes the muffin very moist. 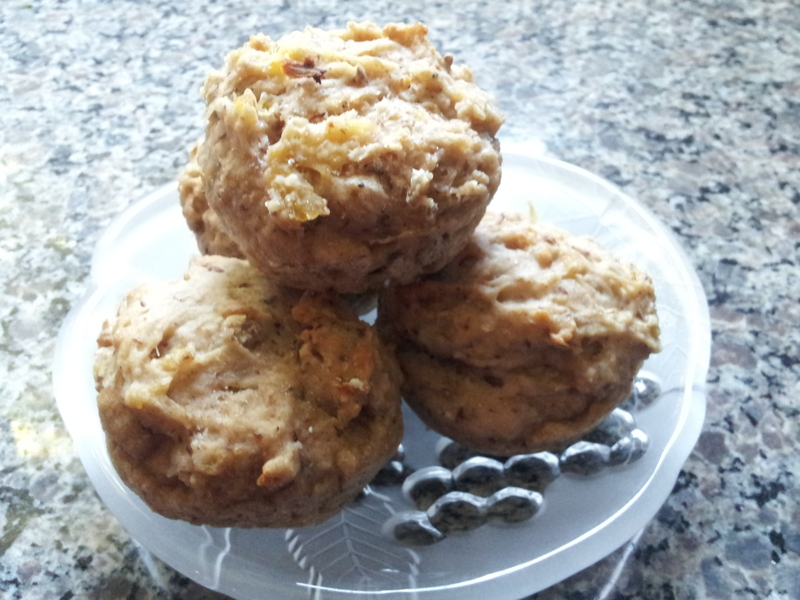 The blog where I got the recipe indicated that the recipe was developed from a banana muffin recipe. So, one could easily replace the mango puree with mashed banana. I kept some out for eating right now, and froze the rest to be eaten as needed. I guess I didn’t really free room in the freezer, but I think the muffins will be eaten quickly.